Excursion to Sénanque Abbey, Gordes Bori Village, and Avignon! On Wednesday, students were asked to wake up a little earlier than normal - around 6am - in order to make an early start for a packed day of traveling. On the schedule were three key locations: Sénanque, the site of a 12th century Cistercian abbey; the Bori village of Gordes, a 16th century village of distinctive stone buildings; and Avignon, home of several popes during the Papal Schism. After a sleepy, two-hour car ride, students were treated to an incredible view of the hill town of Gordes. 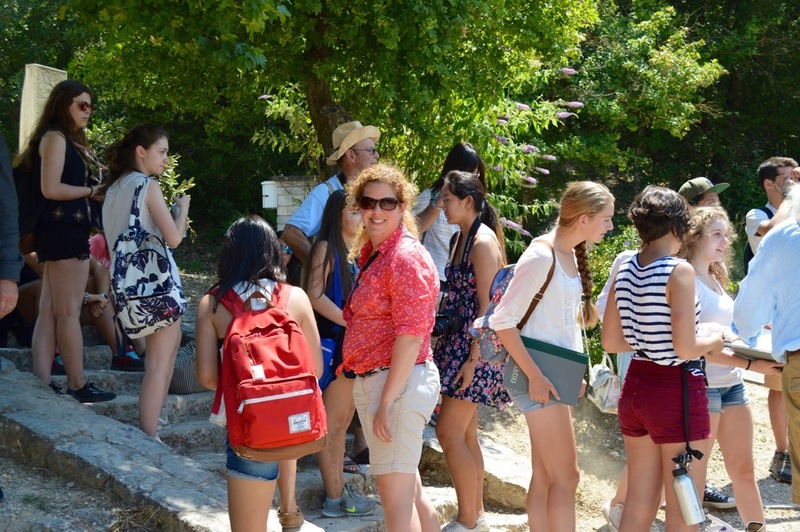 After about an hour and a half at the Abbey of Sénanque, students loaded back into the vans for the short ride to the Bori village in Gordes. The 16th century village, restored in the 1970s, is distinctive for its buildings, which are constructed without any type of cement. The walls are thick and windows tiny, which would have ensured occupants stayed warm in the winters and cool in the summers. After about 45 minutes at the Bori village, students set off for the last destination of the schedule: Avignon. Even programme director Fernando Gonzalez was tired at the end of the day! On return to Les Tapies, students were met with the "super moon" rising above the Ardèche mountains. A perfect end to a wonderful day!